Before leading an overhang, check that you have enough equipment for the job. It may be impossible to obtain more gear later from the second climber. Keep your ascenders handy, because if a piece pulls and you end up hanging, you'll need ascenders to climb back up to your last secure piece. Also, check that your belayer is securely anchored, or you could both end up hanging free in the event of a fall. Balance will be difficult as you scale an overhang because you can't effectively place your feet against the rock. Use of a daisy chain or fifi hook, however, allows you to hang from the harness and achieve a stable position. 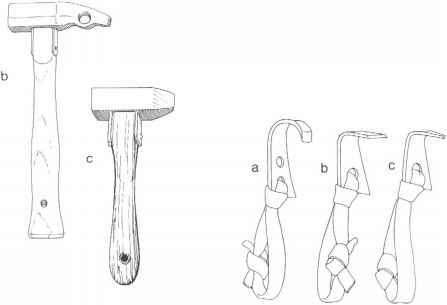 As an overhang approaches the horizontal, you can achieve greater balance still by clipping a sling from a chest harness to the supporting aid piece (fig. 11-26). step of the etriers rather than standing in the bottom steps. Expect to experience some swinging. Finally, because your belayer will probably aid over the overhang rather than use ascenders, consider the length of your partner's reach when making your placements. 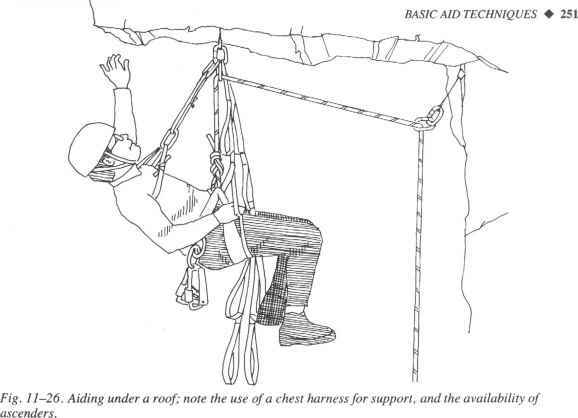 Rope drag is a common side effect of overhangs, but liberal use of longer slings will help. 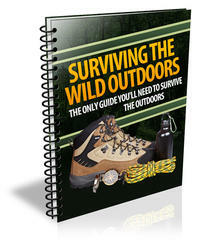 You may also want to pull along a second belay rope and start climbing on it after clearing the lip of the overhang. Finally, try to relax when working out over a big roof. Have confidence in your pieces. Clutching at them won't keep them in place but will drain your strength.